I appreciate Yankee ingenuity and American grit. I love practicality. I am also vain enough to be stung when it is pointed out that something I am doing could be done more elegantly. The stereotype of the French is that they believe they always do things more elegantly than anyone else! 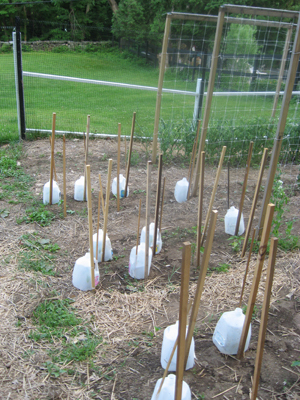 I won’t endanger my friendship with my dear friend, who holds a dual citizenship with America and France, by arguing in favor of practicality over grace, but I will admit that in the case of the garden cloche, the French may have a point. 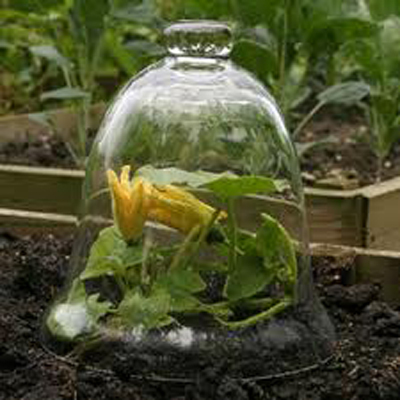 The idea of a cloche is to protect a tender seedling from harsh weather, giving it sanctuary in order to get its feet on the ground, or, in the case of a seedling, to get its feet firmly IN the ground. Beautiful glass, beautiful bell shape, an example of French elegance. 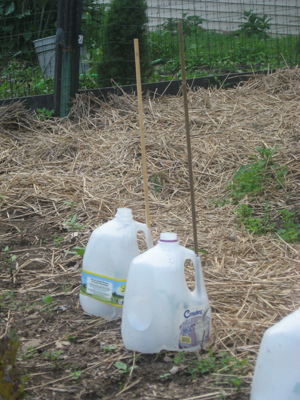 I cut the bottom off of a gallon jug of milk, cut holes for an anchoring stick to slip through the handle, and slid the “cloche” over my young pepper plant, an example of Yankee ingenuity.